I was thinking: A large portion of the population is currently downsizing, which means many people have more stuff than room. This downsizing is usually not a welcomed change, but rather a necessity to save money in a poor economy. Therefore, many people want to keep their belongings for a time when they will have the space to use them again. Luckily, the number of self storage facilities is growing. Not only has the number of storage facilities increased, but so has the quality. 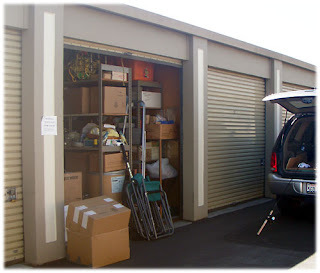 Here are a few things to look for when storing your currently unused items. For starters, you will want to find a facility that is close to home. You never know when you might want or need an item out of storage. Additionally, you will be more likely to visit your storage facility on a regular basis if it is close to home. This way you can check up on your belongings to ensure they are free from damage and theft. This brings up the second thing you should consider when renting a storage unit. How is the security at the facility? Many storage facilities are gated, and require a pin code to enter. Additionally, others will have security guards or staff members that work around the clock. The better the security, the safer your belongings will stay. Finally, consider unit quality. The newer storage facilities are usually nicer, but not always. Look for cleanliness of the unit before you agree to rent it. Make sure it is free of mouse droppings and insects. Most storage units are now equipped with electricity and the more expensive ones offer temperature control. Obviously, cost is always an issue, but with competition of these facilities on the rise you can most likely find a unit that meets your needs for the right price.